Executive function (EF) deficits may underlie some of the impulse control problems seen in pathological gambling. 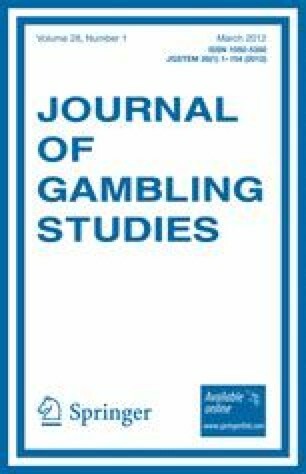 Pathological gamblers (PGs, n = 45) and controls (n = 45) were compared on several measures of EF (including measures of response inhibition, working memory, cognitive flexibility and perseveration, planning and decision-making), as well as memory and intelligence tests to examine whether PGs evidence EF dysfunction. Compared with controls, PGs exhibited specific deficits on measures of planning and decision-making. PGs also exhibited relative deficits on a measure of perseveration, but this deficit was no longer significant after controlling for group differences in intelligence. These results suggest that PGs may experience deficits on specific components of EF. This study and preparation of this report were supported by a grant from the Ontario Problem Gambling Research Centre. The opinions expressed in the publication are not to be construed as those of the Centre or the Ministry of Health and Long-Term Care. We thank Kendrich Bates, Debra Kish, Joi Moore, Lisa Sulkowski, Katie Linehan and the staff of the Windsor Regional Hospital Problem Gambling Services Division.